Most of us are not evolutionary biologists, but since the debate over evolution is unfortunately still so common, it is well worth learning a thing or two about the actual supporting evidence for the theory. Moreover, the body of evidence in support of this theory is so staggeringly large and compelling that you should welcome the opportunity to pull out such a trump card. There are seven or eight main categories of evidence for the theory of evolution, and the impressive part is that these categories belong to very different scientific fields. It is therefore that much more compelling to see so many different fields all independently converging to form an extremely powerful explanation that is corroborated and reconfirmed many times over by an enormous amount of independently distinct data from such diverse backgrounds. 1. Biogeographic evidence – the dispersal of animals around the world. This is what started it all, and what got Charles Darwin to come up with his theory. It arose as Darwin observed the wildlife in the Galapagos islands – a secluded archipelago in the Pacific Ocean. What was so noticeable was that each species of animal on the islands was uniquely adapted to the specific island it was on. It had further been observed that every single animal on the Galapagos islands was either slightly different or allot different from its mainland counterparts. Moreover, every observable difference the Galapagos animals had was oddly advantageous to the specific environment, or even micro-environment it was living in. Further research by many others has revealed that every different environment on the planet seems to house life forms that are uniquely adapted to it as well. At this point, I have heard many creationists say that animals being adapted to their environment still fully conforms to the creationist design theory. But the problem with this is that we humans can, and did, intervene in the dispersal of animals. Hawaii, for example, never had any native mammals or amphibians on it until pigs and frogs were introduced to it by human explorers. On the creationist view, pigs and frogs were not found on Hawaii because they were not suited to that environment, but reality showed otherwise – the mainland pigs and frogs proved so well adapted to the lush Hawaiian environment that their populations have since exploded, causing them to become pests. The apparent reason for there not being any mammals or amphibians on Pacific ocean islands appears to be that they could not survive the trip there (usually a result of being swept away in a storm), like reptiles, insects and birds could. The dispersal of animals on the planet is probably the simplest category to observe, and the simplest to experiment with – revealing how life does indeed adapt to the environment and not the other way around. 2. Paleontology – the fossil record. The most important thing the fossil record shows us is that different forms of life existed at different times. Fossils are like snapshots of animal and plant life that essentially got petrified after the mud they died in became sedimentary rock. The convenient thing about fossils and sedimentary rock layers is that it consistently arranges itself in chronological layers, with each new layer settling on top of the previous one. This allows us to see that dinosaur fossils, for example, are not to be found anywhere in the world in any sedimentary layers newer than 65 million years ago. Mammals, on the other hand, are not to be found in any layers older than 210 million years ago, and so on. What this means is that there has been a progression of different animals at different times. These fossilized “snapshots” don’t give us any conclusive causal evidence for evolution in and of themselves, but they do show a progression, and an adaptive change over time between animals and their environment. One easy way in which this type of fossil record could be disproved is if a single case of a single fossil would be found in an unexpected layer/time period. If a fossil of a rabbit, for example, would be found in Precambrian layers, or a fossil of a modern horse would be found in Triassic layers, this entire body of evidence would be disproved. As of yet, none have been found anywhere on the planet – despite comical attempts to display otherwise by such establishments as the Creation Museum. A good example of fossil evidence for evolution can be found in the case of humans – Homosapiens (you can do this with any other animal as well). In relatively recent sedimentary layers, we can find Homosapien fossils, but when we dig deeper into older layers, we no longer find them, we only find fossils of hominid creatures that have more ape-like characteristics. The deeper we dig, the more ape-like these fossils become, and if we dig even deeper, the only ape-like fossils we find begin to look more like monkeys than apes. 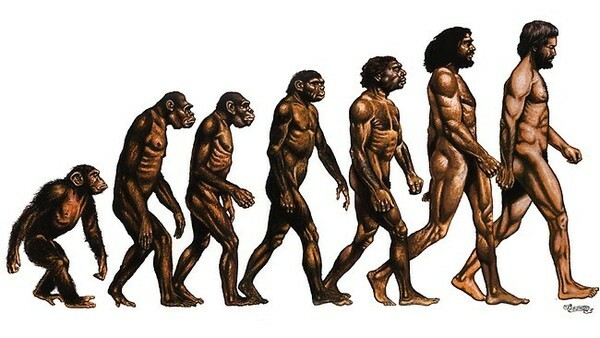 When we do this same kind of research with chimp fossils, we see that the further back we go, the more the chimp fossils begin to resemble the same ancient ancestor the hominids and then the apelike hominids have, until we get to an old enough layer where there is no longer a difference between the hominid fossils and the chimp ancestor fossils – they have “converged” into one common ancestor. 3. Developmental biology – the evidence from comparative anatomy. The main point here is that there are many striking similarities between different animals. These similarities suggest some type of kinship. The common bone structure of all mammals is one good example of this. All mammals have exactly the same number and general structure of bones, they simply take different shapes and forms in different animals. The brain is also a good example. We can see that many animals share the same core brain structures that control basic functions, while more advanced animals with higher intelligence have larger frontal and prefrontal lobes – culminating in humans who have the largest ones. Yet, despite our large frontal and prefrontal lobes, we still share the more basic brain parts, like the brain stem and the Cerebellum, with other mammals and reptiles. The more intelligent the animal, the larger its brain will be, and the more emotional and intellectual traits an animal shares with us humans, the more its brain will resemble our human brain – suggesting a strong evolutionary connection. This body of evidence includes the variety of adaptive changes we have not only noticed in nature, but that we have also managed to create ourselves. In nature we can actually see bird beak size and shapes adapt to insect type and distribution, as these change over time. In humans we can see the that cattle raising societies in Europe and East Africa, have higher lactose tolerance (by virtue of an enzyme that is more prevalent in their bodies) than other non cattle raising societies. Scientists have also conducted experiments on animals and microbes in which an initial population is exposed to a new condition, and over time it is observed that the population makeup changes to include more and more subjects that are tolerant of the new condition. This can regularly be noticed in the case of herbicides and pesticides, which have to keep getting adjusted because various plants and animal populations evolve immunities to the original poisons. The same exact process can be seen in the need for ever changing vaccinations against flues, for example, due to these viruses evolving immunities to the previous vaccines. 5. Evidence from observed speciation. Though creationists often claim that evolution, as it pertains to speciation, has never actually been observed in real time, we have quite a few cases where it has indeed been observed. Scientists have managed to take one population of insect or bacteria, split it into different groups, put each group under different environmental conditions, and observe how after a few dozens of generations, the groups have grown (evolved) so much apart that they can no longer even mate with each other if combined again – the definition of speciation. In nature we have also observed this happening with various types of migrating birds, plants and fish. In other cases, animals like mice and pigs that were introduced by humans to areas where they did not exist in before, have also been observed to become so different from their original populations over the course of a few centuries, that they can no longer breed with animals from their original populations. In the case of the polar bears, we see an animal that appears to be in the middle of a long natural process of speciation. Polar bears can still mate with brown bears, but the two bear types have been growing apart for so long due to the differing environmental conditions they live in, that it is expected they will soon become genetically distant enough to not be able to interbreed anymore. 6. Evidence from artificial selection. This category is one of the best answers to the silly creationist claim that animals can’t change appearance in any dramatic way. The two best examples for this are dogs and wild cabbage. Dogs, as you might already know, are all descendants of wolves, but what is so surprising about them is the variety of sizes, shapes, colors and behavioral traits that have been bred into them in the last 10,000 years or so. Although all dogs are still the same species (meaning they can all interbreed) the sheer differences between Great Danes, Chihuahuas, Huskies, Pugs, Mastiffs and pomeranians is so striking, and so strikingly recent – happening within written record – that it is no stretch to imagine each of these sub breeds separating into individual species over a long enough period of time. In the case of the cabbage family, we also see how within written and observable history, one original plant – the wild cabbage – has been bred to take many different forms. These forms range between regular cabbage to kale, collard-greens, broccoli, brussel sprouts and kohlrabi. All of this variety, not unlike dog variety, originating from one common ancestor. If humans can breed different plants and animals, and cause them to take wildly different forms over the course of a few millennia, just imagine what can naturally occur to plants and animals over the course of hundreds of millions of years. Well, actually, you don’t really need to imagine it – just look around you. The most exciting thing about the genetic evidence is that it not only shows the genetic differences and similarities between different plants and animals, it completely vindicates all of the above mentioned bodies of evidence. We no longer need to wonder if we are indeed closer cousins of chimpanzees than of spider monkeys – the genetic evidence shows us exactly how close we are to each animal species. Similarly, we don’t have to guess that all dogs are descendants of wolves – we have genetic evidence to prove this is so. As for the observed speciation, we can actually see how the genetic makeup of these species is drifting apart in real time, untill it is so different, they can no longer interbreed. This is the same thing geneticists see when comparing original plant and animal populations that were not resistant to herbicides and pesticides, and those that are. They also analyze flu viruses and can actually see the genetic differences occurring in real time as a certain virus population becomes immune to old vaccines. And in the case of the animals on the Galapagos islands, bearing some similarities to their mainland counterparts, despite a variety of differences, we, again, no longer need to guess, we have genetic evidence to show us exactly how close they are to specific groups of animals on the mainland. The independent genetic evidence is so powerful, and serves as such a conclusive vindication of the other bodies of evidence, that it conclusively and decisively wins – game, set and match – the case for evolution. And as if the seven categories mentioned above were not more than enough, there are many other scientific fields and sub-fields that fully corroborate all of the above mentioned evidence. These fields include geology, chemistry, epidemiology, neuroscience, various fields of medical science, and more. It truly is quite impossible to take seriously anyone’s opposition to such an enormous mountain range of conclusive evidence. And then when we see what fantastically preposterous counter arguments are presented in opposition to evolution, it becomes that much more comical.